On casual inspection this northern morel is very similar to the more widely distributed eastern species Morchella angusticeps. But Morchella septentrionalis is smaller than Morchella angusticeps, and it has smaller spores. Additionally, it tends to appear in the vicinity of--or even fruiting from--the decaying wood of big-toothed aspens and other hardwoods. 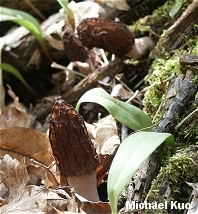 So, while it is true that large specimens of Morchella septentrionalis might be confused with small specimens of Morchella angusticeps and require microscopic analysis for positive identification, it is at least possible to tell these species apart without DNA analysis (unlike, for example, Morchella sextelata and Morchella septimelata). 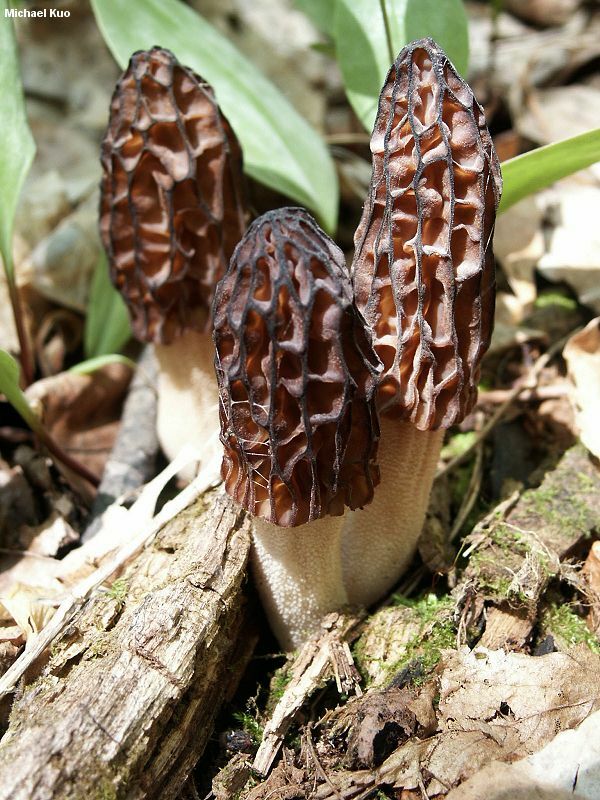 And, since Morchella septentrionalis does not appear to be distributed south of about the 45th parallel, the potential confusion will only arise in the northern Midwest and in northeastern North America. 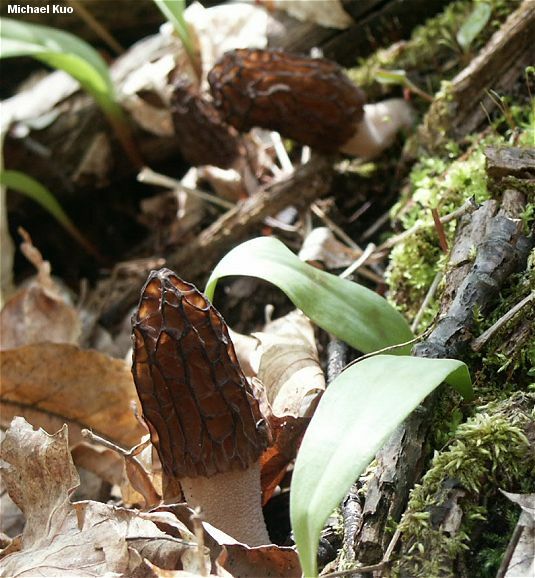 Morchella septentrionalis is apparently one of the few black morels that can be distinguished through basic RFLP analysis of the ITS region alone, as reported by Carter in the Morel Data Collection Project; cross-checking Carter's results with results from expensive and time-consuming sequencing of four genes as reported in O'Donnell and collaborators (2011) and in Kuo and collaborators (2012) revealed a 100% success rate for RFLP's ability to predict this species. Ecology: Possibly saprobic and mycorrhizal at different points in its life cycle; appearing under hardwoods, including big-toothed aspen and white ash; usually growing near woody debris or growing directly from rotted hardwoods; May; north of about the 45th parallel from Michigan to New York. Cap: 3-4.5 cm tall and 1.5-2.5 cm wide; conical, bluntly conical, or with a rounded apex; pitted and ridged, with the pits primarily arranged vertically; when young with finely velvety or nearly bald, flattened, tan to brown ridges and brownish pits; when mature with flattened to sharpened or eroded, black ridges and brown to yellowish brown pits; attached to the stem with a small groove (2-3 mm deep); hollow. Stem: 2-3 cm high and 1-1.5 cm wide; equal, or with a slightly swollen base; whitish; finely mealy with granules; sometimes developing a few folds near the base; hollow. 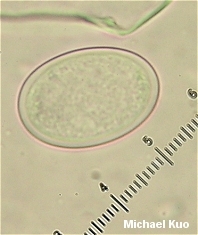 Microscopic Features: Spores (19-)20-22(-25) x 11-15 µ; smooth; elliptical; without oil droplets; contents homogeneous. Asci 8-spored. Paraphyses cylindric with variable apices; septate; hyaline in KOH. Elements on sterile ridges 75-175 x 7.5-25 µ; septate; hyaline to brownish or brown in KOH; terminal cell cylindric, subclavate, clavate, widely fusiform, utriform, or occasionally irregular. SPECIMENS EXAMINED: Herb. F. 05080305, 05100302, 05110303, 05110306, 05150302, 05190301, 05110405 (holotype), 05120401, 05060602. Kuo, M. (2012, October). Morchella septentrionalis. Retrieved from the MushroomExpert.Com Web site: http://www.mushroomexpert.com/morchella_septentrionalis.html.